Newly built and enamored with luxury, Today's Sunrise Luxury Resort is one of the best hotels in Neemrana. Situated in close proximity to Gurgaon and Delhi, Today's Sunrise Luxury Resort in Neemrana is not only perfect for corporate and business tourists, but also for families looking for a fun weekend. Spread over 10 acres with just 24 rooms, it is the perfect place to relax, repose and reenergize in. Whether looking for a stopover en route Jaipur or searching for the perfect getaway for the weekend or seeking a hotel for your business associate, Today's Sunrise Luxury Resort, Neemrana hotel fills in all the blanks providing its distinct and affordable services to a gamut of clientele. Soak in the spectacular views of the Aravalli Range, unwind with a dip in the pool, watch your kids have fun at skating, or simply sit in your private garden or private sit out overlooking the verdant green, there are facilities galore to be experienced at the Today's Sunrise Luxury Resort. The Neemrana hotel offers a wide range of facilities swimming pool, tennis courts, children’s play area etc. Many corporate tourists who are looking for great accommodation in Gurgaon also make this wonderful hotel in Neemrana their first stop. The hotel offers the perfect mix of personal and professional amenities that are just ideal for business tourists. 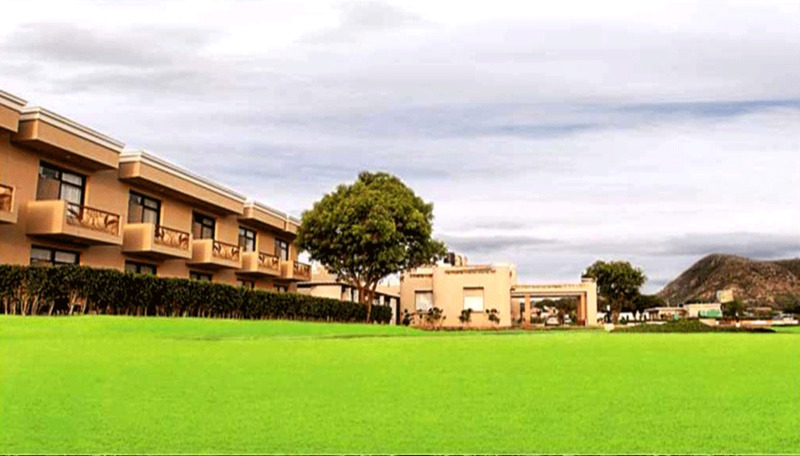 So whether you have a meeting with your business associate, want to work on your project in the surreal surroundings or just want to chill out, Today's Sunrise Luxury Resort is certainly one of the best hotels in Neemrana..
Today's Sunrise Luxury Resort has got all you need to rejuvenate yourself over the weekend, you just have to find what interests you the most. For families looking for that perfect weekend destination, Today's Sunrise Luxury Resort is nothing short of a paradise, kids will simply have a blast here. That is why the property is ranked among the best hotels in Neemrana. Located within a few minutes distance from the Japanese industrial zone, the Neemrana Fort, and several Japanese restaurants, the hotel also offers an affordable option for many. Must you require any additional favours our front desk team is available 24 hours at your service to assist you in your requirement. NH-8, Dughera, Neemrana, Rajastan - 301701. India. Copyright © 2018 Today's Sunrise Luxury Resort, All Right Reserved.